Wednesday January 24th 1883 We working all day long. Washed out a lot of sheets in the forenoon and Bridget and I both ironed some in the afternoon I went with Elmer down to Aunt Marys for chickens and was gone about an hour Rob and I went over to the City hall to a reception and had a splendid time. Weather stormy in the evening. Thursday January 25th 1883 Weather more pleasant today I helped some with the work and knit all the time I could get on Lees mittens I had a letter from Charlie. 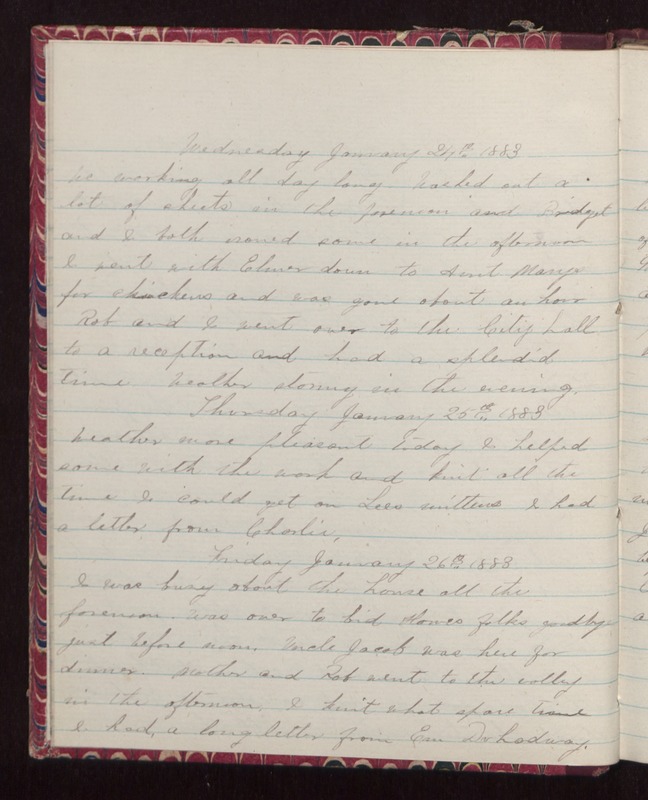 Friday January 26th 1883 I was busy about the house all the forenoon. Was over to bid Howes folks good-bye just before noon. Uncle Jacob was here for dinner. Mother and Rob went to the valley in the afternoon. I knit what spare time I had, a long letter from Em Duhadway.